"Sometimes being a brother is even better than being a superhero". Holly LeCraw, an American author, created a heart-touching tale, The Half Brother, about two brothers who had different fathers and how their complex relationship and some dark family secrets fills them up with loss and regret. When Charlie Garrett arrives as a young teacher at the shabby-yet-genteel Abbott School, he finds a world steeped in privilege and tradition. Fresh out of college and barely older than the students he teaches, Charlie longs to leave his complicated southern childhood behind and find his place in the rarefied world of Abbottsford. Before long he is drawn to May Bankhead, the daughter of the legendary school chaplain, but when he discovers he cannot be with her, he forces himself to break her heart, and she leaves Abbott—he believes forever. He hunkers down in his house in the foothills of Massachusetts, thinking his sacrifice has contained the damage and controlled their fates. Nearly a decade later, his peace is shattered when his golden-boy half brother, Nick, comes to Abbott to teach, and May returns as a teacher as well. Students and teachers alike are drawn by Nick’s magnetism, and even May falls under his spell. When Charlie pushes his brother and his first love together, with what he believes are the best of intentions, a love triangle ensues that is haunted by desire, regret, and a long-buried mystery. Charlie Garrett, a young and freshly-out-of-college-graduate escapes his complicated Southern family life in Atlanta to Abbott School, in north–central Massachusetts near Vermont as an English teacher. And on his second year in Abbott School, he falls hard for May Bankhead. May Bankhead, youngest of the three Bankhead siblings, whose father is the chaplain of the Abbott School, and is also a student of the same school where Charlie teaches. She responds to Charlie's feelings after her trip and she falls head over heels in love with Charlie, but their love didn't last long after her father's tragic death. Moreover, when returns back as a teacher in the Abbott School, she meets Charlie's half-brother, Nick. Nick Satterthwaite, Charlie's half-brother, the son who was born correctly with a father and a mother, the charming golden boy who easily attracts anybody's attention, is a boy with secrets and one of the most important piece of puzzle in Charlie's already complicated life. His life begins when he comes to stay with Charlie 10 years after the chaplain's death of Abbott School where he joins as a teacher and his relationship with May Bankhead takes a new turn. But the secret which destroys May and Charlie's sweet relationship wasn't enough in his life, when Nick's secrets come out, it destroys almost everything Charlie ever had in his content life. 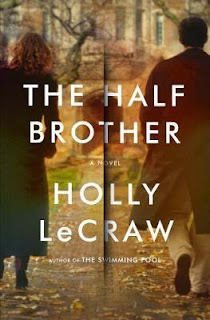 Holly LeCraw whose debut novel, The Swimming Pool, was the Top Debut of 2010 (Kirkus) and a Best Book of Summer (The Daily Beast and Good Morning America), but unlike her previous book, The Half Brother couldn't make us fall for it. Yes the book has a great setting, an engrossing storyline, addictive narrative, compelling plot, but somewhere the story feel short, well maybe, I was expecting, I would see this story from all the primary characters POV instead of one. The prose is articulate but the pace is slow, it's more like the book takes a longer time to fall for it's hidden charm in the author's writing. The author have brilliantly unfolded the story, throwing us off the edge with some darkest and ugliest family secrets at the right moments to keep us hooked to the story. Moreover, her storyline is interlaced with deep human emotions that will make you feel the compassion and warmth in the author's style of writing. The characters, we only know them from Charlie's POV and I so much wished them to have their own voice so that I could have judges them better. I don't know if there is a man like Charlie in this world, and in one sentence, I would describe him as "once a martyr, will always be a martyr". I mean he always puts other people's feeling before his own. His love for May is the one thing that keeps us rooting for this self-less and lonely soul. I could feel his pain in each and every word. His childhood is not a happy one, growing up without a father made it difficult for his to have a stand in his step-family. So from Charlie's eyes, we see the whole story and according to him, May had always been an immature and wild soul and will always be one, and nothing makes an impact to her carefree activities. Nick is the mysterious one, way too charming and alluring, and always acts like he is the youngest and pampered one. Charlie's mother Anita and May's mother, Florence, were living a life of lie without thinking about the consequences and I didn't feel any respect for their characters. Yes, the characters are not like any everyday character yet they are quite strong enough to keep you engrossed into the story, well, to be honest their secrets and flaws are what will keep you engaged into the story. This is a great family story which will devastate your mind with the pain and the depth of the secrets, which can easily loosen those strong bonds of relationship. Moreover, the author's descriptions are intricately long and the setting of Vermont and the southern city of Atlanta were vividly portrayed. Verdict: Read the book if you enjoy a complex story about family secrets. Courtesy: Thanks to the author Holly LeCraw and her publicist from Penguin Random House, for giving me an opportunity to read and review her novel. Holly LeCraw was born and raised in Atlanta, granddaughter of a former mayor and daughter of the founder of Oxford Book Store, where she worked throughout high school. She graduated from Duke University and later received a master's in English from Tufts University. She now lives outside of Boston with her husband and three children. Her debut novel, The Swimming Pool, was a Top Debut of 2010 (Kirkus) and a Best Book of Summer (The Daily Beast and Good Morning America). Other work has appeared in Post Road and has been nominated for a Pushcart Prize. She is at work on her next novel, The Half Brother, which will also be published by Doubleday.